This is an introduction to how an electromechanical relay works, and why they're a modder's friend. (This does not cover solid state relays. You can find out about those here. A relay is nothing more than a switch, operated by a magnet. A typical relay like we use here (this is a SPDT type), has three main parts - the contacts, a coil, and an armature. It may or may not have an additional spring which is used to help pull the armature back to the open position when the coil is de-energized. The relay shown here just uses the memory of the bend in the metal as a spring. The external part of the contacts is where you make your connections. The internal part of the contacts are connected to the other parts of the relay. The coil is an electromagnet. A core made of iron with copper wire wound tightly around it. When current flows around the iron and through the wire, it creates a magnetic field. This attracts the armature toward the coil and 'flips the switch' inside the relay. The armature is the only part that moves. It is connected to '30' on one end, and has contacts on the other end. These contacts move between 87 and 87a, depending if the coil is on or off. 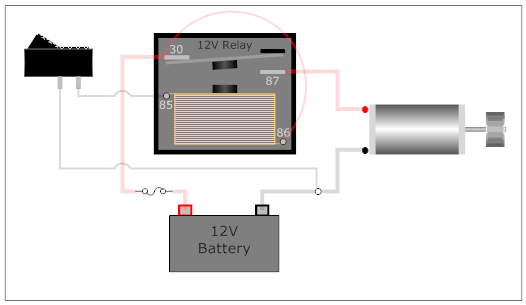 To make a relay function, you need to supply power to the coil. Poles 85 and 86 are the connections you need. On most relays, it makes no difference which one is positive or negative. 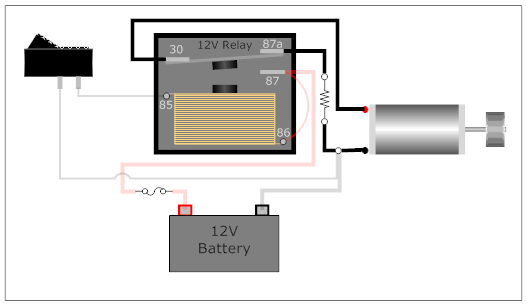 Does your relay have a suppression circuit? Check the drawing. Most relays will have a schematic of the insides printed right on the housing. There are some relays with internal suppression circuits. The suppression circuit is generally a resistor or a diode parallel to the relay coil. The relays with a diode suppressor will have polarity sensitive coil connections. This means that the proper relay coil terminal (the positive terminal) must have the positive voltage applied to it. If the relay is connected improperly, the relay may be damaged or in some cases it simply won't operate. This first one demonstrates how a relay can be used to switch high current (such as a motor) using a low current signal. Here, we see the relay controlling two outputs - when the relay is open, it powers two LEDs. When the coil is powered and the contacts close, it powers the motor. The third diagram shows how a relay can be used with two 'inputs' and a single 'output' being used to drive a motor, and then auto-brake when the switch is released. * SPST – Single Pole Single Throw. These have two terminals which can be connected or disconnected. Including two for the coil, such a relay has four terminals in total. It is ambiguous whether the pole is normally open or normally closed. The terminology "SPNO" and "SPNC" is sometimes used to resolve the ambiguity. * SPDT – Single Pole Double Throw. A common terminal connects to either of two others. Including two for the coil, such a relay has five terminals in total. * DPST – Double Pole Single Throw. These have two pairs of terminals. Equivalent to two SPST switches or relays actuated by a single coil. Including two for the coil, such a relay has six terminals in total. The poles may be Form A or Form B (or one of each). * DPDT – Double Pole Double Throw. These have two rows of change-over terminals. Equivalent to two SPDT switches or relays actuated by a single coil. Such a relay has eight terminals, including the coil. The "S" or "D" may be replaced with a number, indicating multiple switches connected to a single actuator. For example 4PDT indicates a four pole double throw relay (with 14 terminals). Make sure you select a relay with a high enough amperage rating for your application. Most automotive style relays are rated between 30-40 amps which is usually high enough for our Power Wheel applications. In addition, pay attention to the coil voltage. This is the voltage at which the coil will energize enough to close the relay. Common voltage ratings are 6v, 12v, and 24v. We generally use relays here to switch a high-current load with a low-current signal. Usual applications where you would find a relay are in keyed ignition, remote kill set-ups and NOS/Turbo buttons. Some advanced modders here have come up with ways to take the high-current load off the shifter and throttle switches using relays. This prolongs the life of the switches and increases the overall reliability. One of the main benefits of using a relay is being able to use a small, inexpensive switch, or even a remote control unit to perform high-current switching or multiple switching functions. For example, the output of one relay can be used to energize the coil of another relay, creating an automatic switch. Anyone have a diagram they feel should be included, send me a message! Last edited by CJB on Wed Feb 09, 2011 12:52 pm, edited 2 times in total.